With each repetition, we allow ourselves to open ever more deeply to the living experience behind the words. As we do, the practice leads to a profound deepening of our faith: The more fully we open to and inhabit each refuge, the more we trust our own heart and awareness. By taking refuge we learn to trust the unfolding of our lives. The first step in this practice, taking refuge in the Buddha, may be approached on various levels, and we can choose the way most meaningful to our particular temperament. We might for instance take refuge in the historical Buddha, the human being who attained enlightenment under the Bodhi Tree 2500 years ago. This doesn’t mean that we are worshipping the man who became enlightened, or setting him up as “other” or as “higher” than ourselves, but bowing and honoring the Buddha nature that already exists within us. For instance when the Buddha encountered Mara, he felt fear—the same painfully constricted throat, chest and belly, the same racing heart that we each experience when fear strikes our heart. By willingly meeting fear with his full attention, the Buddha discovered fearlessness — the open, clear awareness that recognizes the arising and passing of fear without contracting nor identifying with it. Taking refuge in the truth of his awakening can inspire us on our own path toward fearlessness. At the same time, those who are devotional by nature might seek safety and refuge in the living spirit of the Buddha’s awakened heart and mind. Much like praying to Christ or the Divine Mother, we can take refuge in a Being or presence that cares about our suffering. In taking this first refuge, I sometimes say, “I take refuge in the Beloved” and surrender into what I experience as the boundlessness of compassion. When I am feeling fear, I surrender it to the Beloved. By this, I am not trying to get rid of fear, but rather letting go into a refuge that is vast enough to hold my fear with love. 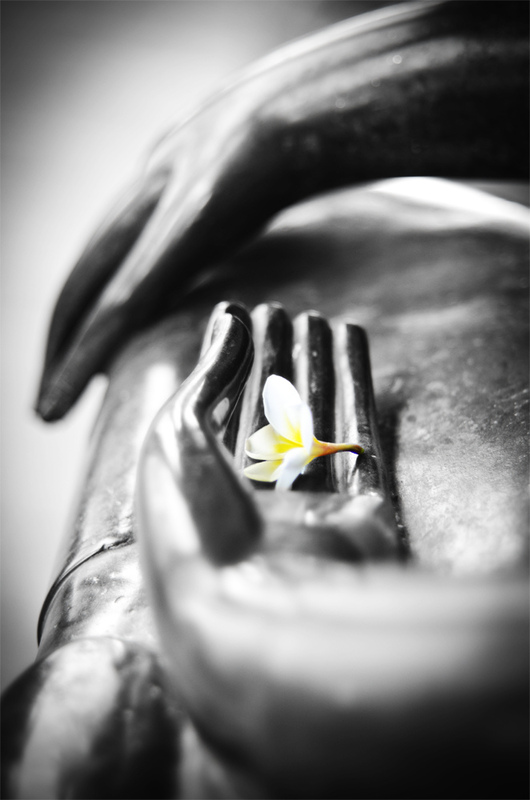 In the most fundamental way, taking refuge in the Buddha means taking refuge in our own potential for liberation. In order to embark on a spiritual path we need faith that our own heart and mind have the potential to awaken. The true power of Buddha’s story, the power that has kept it alive for all these centuries, rests in the fact that it demonstrates what is possible for each of us. We so easily believe limiting stories about ourselves and forget that our very nature—our Buddha nature—is aware and loving. When we take refuge in the Buddha, we are taking refuge in the same capacity of awareness that awakened Siddhartha under the Bodhi Tree. We too can realize the blessing of freedom. We too can become fearless. After taking refuge in the Beloved, I turn my attention inward, saying “I take refuge in this awakening heart mind.” Letting go of any notion that Buddha nature is something beyond or outside my awareness, I look towards the innate wakefulness of my being, the tender openness of my heart. Minutes earlier, I might have been taking myself to be the rush of emotions and thoughts moving through my mind. But by intentionally taking refuge in awareness, that small identity dissolves, and with it, the trance of fear. By directing our attention towards our deepest nature, by honoring the essence of our being, our own Buddha nature becomes to us more of a living reality. We are taking refuge in the truth of who we are.